shirley joined Watsi on December 25th, 2013. 44 other people also joined Watsi on that day! shirley's most recent donation supported Kelvin, a boy from Tanzania, to fund burn repair surgery. shirley has funded healthcare for 15 patients in 8 countries. Leas is a food vendor from Cambodia. She has one daughter. She enjoys listening to social programs and monks pray on the radio. Three years ago, Leas developed a cataract in her left eye, causing her blurred vision, tearing, and photophobia. She has difficulty seeing things clearly, recognizing faces, and going anywhere outside. When Leas learned about our medical partner, Children's Surgical Centre, she traveled for half an hour seeking treatment. On February 12, doctors will perform a phacoemulsification surgery and an intraocular lens implant in her left eye. After recovery, she will be able to see clearly. Now, she needs help to fund this $211 procedure. She says, "I hope my vision is clearer so I can easily do my work at home and take care of my husband." Ratha is a rice farmer from Cambodia. He has two daughters. He likes to play football, listen to music, and watch action movies. Two months ago, he had a tree logging accident and injured his foot. It is difficult for him to walk, and he is in pain. When Ratha learned about our medical partner, Children's Surgical Centre, he traveled for two and a half hours seeking treatment. On February 5, surgeons at CSC will perform a skin graft procedure to to heal his wound and allow him to walk painlessly again. Now, Ratha needs help to fund this $440 procedure. He says, "After this operation, I hope I can walk normally again and without pain, so that I can complete my work and support my family." Juana is an 11-year-old girl with Down Syndrome. She lives with her mother and seven siblings in Guatemala's rural western highlands. She is the youngest in her family, and is doted on by her mother. 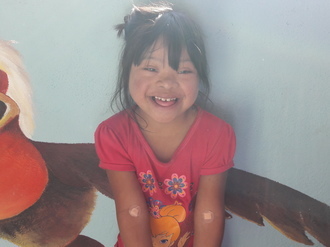 Juana attends a special needs school, and loves her classes and teacher. She likes to learn songs and play with her classmates. Juana desperately needs heart surgery. She was born with a defect in one of her heart’s walls, a common disorder in children with Down Syndrome. Congenital heart diseases like this, if left untreated, can progress to severe disability and death. Fortunately, there is an operation that can remedy this defect and save Juana’s life. She has undergone years of exams, labs, and the insertion of a cardiac catheter in order to be able to undergo this procedure. However, her family cannot afford to pay for the operation. Her mother became a widow shortly after Juana’s birth and is already scrambling to make ends meet for her eight children. We need to raise $1,500 to fund Juana’s heart surgery on November 29. 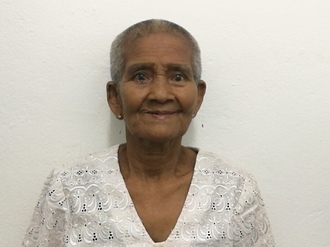 In addition to the operation itself, this fundraising goal will also cover her lab tests, hospital stay, and food and lodgings for her mother to stay with Juana at the hospital. "I wish for my daughter to be well so that she can be a girl with many opportunities," shares Juana’s mother. Let’s help make that dream a reality. Meet Chhin, a 73-year-old man from Cambodia. He is married with two sons, five daughters, and ten grandchildren. He enjoys visiting the pagoda and listening to monks pray. 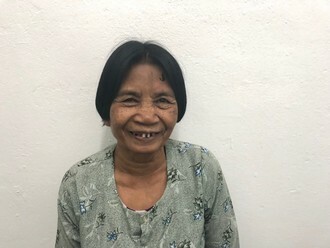 Six months ago, Chhin developed mature cataracts in each eye. A cataract occurs when a thin, cloudy layer forms over the eye’s lens. This causes him blurred vision, discharge, tearing, and fear of bright lights. It is hard for him to see clearly, do work, or go anywhere outside. "I hope my eye can see everything clearly again,” shares Chhin, “Then, I can go anywhere outside." After learning about our medical partner, Children's Surgical Centre, Chhin and his daughter traveled three hours to visit their clinic. They learned that a simple surgical procedure may restore Chhin's sight. On October 21, Chhin underwent cataract surgery, during which his old lenses were removed and replaced with sheer artificial implants. He needs help to fund this $292 procedure. Trylin is a 58-year-old woman with two sons, five daughters, and twelve grandchildren. She likes to listen to the news on the radio in her free time. One year ago, Trylin developed a cataract in each eye, causing her blurred vision, tearing, irritation, and extreme sensitivity to light. It is difficult for her to see things, recognize faces, do any work, and go anywhere outside. On October 27, Trylin underwent a cataract removal and a lens implant in each eye. After recovery, she will be able to see clearly again. Now, she needs help to fund this $292 procedure. "I hope my eyes can see everything more clearly...so that I can easily do my housework, take care of my grandchildren, and do any work. I want to be able to go anywhere," shares Trylin. Phyllis is a 40-year-old single mother from Kenya. Our medical partner, African Mission Healthcare Foundation (AMHF), tells us that she currently relies on odd jobs to provide for her two teenaged children. Her brother also supports the family, but he earns very little as a casual laborer. Earlier this month Phyllis slipped and fell, fracturing her right tibia. As a result of the fracture, she is in constant pain and has difficulty walking, which in turn inhibits her from working. “If not treated Phyllis will continue to endure the pain, and she may end up [with an improperly healed fracture (malunion)], deformity, or infection,” states AMHF. An open reduction and internal fixation (ORIF) procedure is necessary to address Phyllis’s condition. During an ORIF, her leg bones will be realigned and set so that her tibia can heal properly. Phyllis’s treatment will cost $1,125: In addition to her surgical fees, these funds will also cover 21 days of checkups from medical staff and a 14-day hospital stay. “I pray that God will help me to have a successful surgery, and hope Watsi will come to my aid. I have to be well for my children,” says Phyllis. 8-year-old Arnold was born with a cardiac condition called complete atrioventricular septal defect, in which multiple holes exist between the upper and lower chambers of his heart. “He also has Down syndrome,” says our medical partner, Haiti Cardiac Alliance (HCA). “Blood flows through the holes in his heart without first passing through the lungs to get oxygen, leaving him sickly and short of breath. Because of the severity of this condition, there is a chance it may not be repairable, but the only way to determine this is by inserting a catheter into the chambers of his heart. Since this is not possible in Haiti, arrangements are being made to bring him to Dominican Republic to perform this extremely important test in the hopes that he can have heart surgery later in the year.” Arnold lives in Haiti with his mother, father, and seven brothers and sisters. 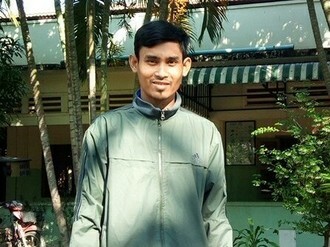 He is the youngest and is unable to attend school. His mother tells us that he likes helping around the house and playing with his siblings. For $1500, Arnold will be transported to the Dominican Republic for this procedure. A catheter will be inserted into the chambers of his heart to determine whether or not his condition is operable. “If operable, plans will then be made to move forward with his surgery as soon as possible,” HCA continues. “It makes me sad to see Arnold get tired so easily and not be able to run and play,” his mother says. “I am hoping the doctors can fix this problem."